Hollybeary Creations : YNS November Sneak!!! Happy Saturday everyone!!! It's time for the November release from Your Next Stamp. Today the Design Team is sharing sneaks at some of the new products that will be available tonight at 10pm est. and be sure to join us at 10pm for our New Release Blog Hop and a chance to Win a $25 GC to the store. 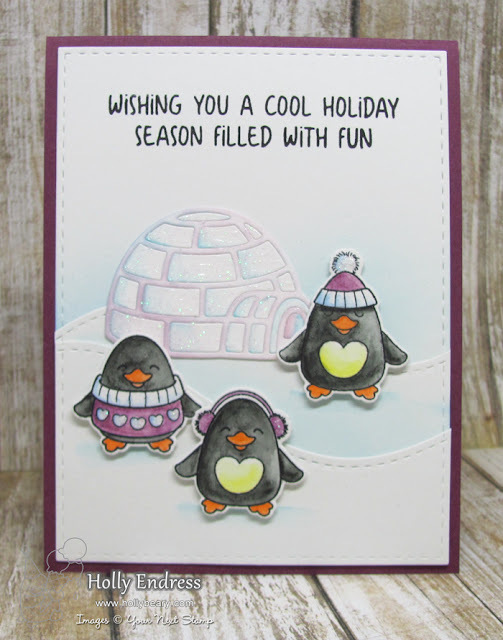 I'm sharing a Peek at the new Waddles Winter Wonderland Stamp and Die set and the Igloo Die. I die cut a piece of Bristol paper with the Large Stitched Rectangle die set and then I die cut a few more pieces with the Double Stitched Hillside die to create snow banks. I added some Tumbled Glass Distress ink behind the snowbanks and adhered them with a tape runner. Then I stamped the sentiment along the top using Black Olive Ink. I adhered the panel to a Purple card base and set it aside. 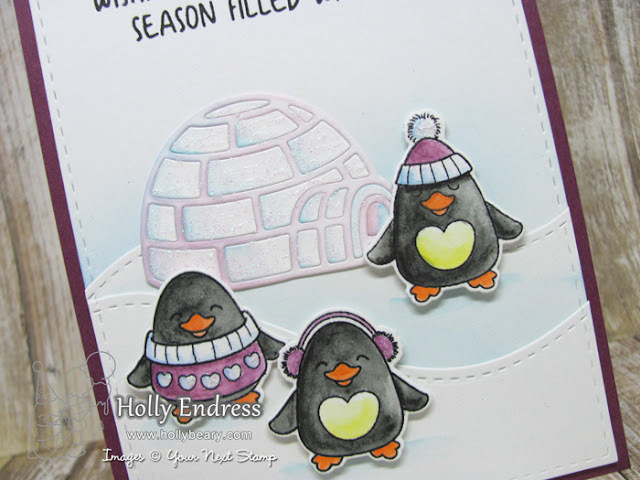 I die cut the Igloo from some additional Bristol paper and added some color with Tumbled Glass and Milled Lavender Distress Inks. Then I paper pieced it back together and added some Glitter Nuvo Drops. I adhered the Igloo to the scene with liquid glue. I stamped each penguin onto some Bristol paper and colored them in with Inktense Pencils and a water-brush. Once they were dry I used the coordinating dies to cut them out and adhered them to the panel with foam tape. I added some Glitter Nuvo drops to a different area of each penguin. This is such a cute set!!! 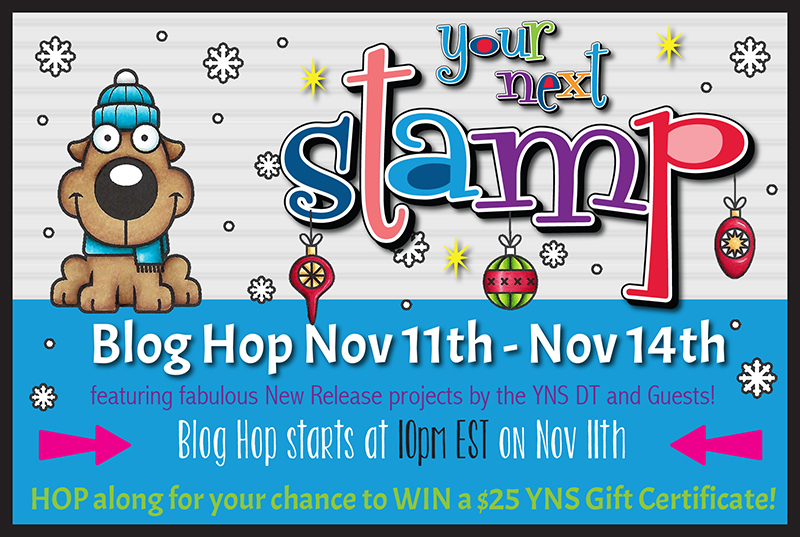 Head over to the YNS Blog for more peeks from the Design Team and don't forget to join us at 10pm est tonight for the Blog Hop and all the products will be available in the store! Ooooh that's super adorable!! Can't wait to see the release! What a beautiful job on the penguins! they are precious! Absolutely adorable !! The igloo is so beautiful ! !